Heidelberg in Melbourne in the late nineteenth century had quite the burgeoning art scene. The Museum of Modern Art at Heide in Bulleen is one such place you can still visit that exists as testament to the area’s past and also to showcase contemporary art. I am ashamed to admit that one gorgeous Sunday, it took a visit from a dear interstate guest Kathleen for me to revisit. I’d been about a decade ago to see some Picasso etchings. We were joined by Rob and C, both of whom are originally from Perth and more frequent visitors to Heide despite not living quite as near as I do. 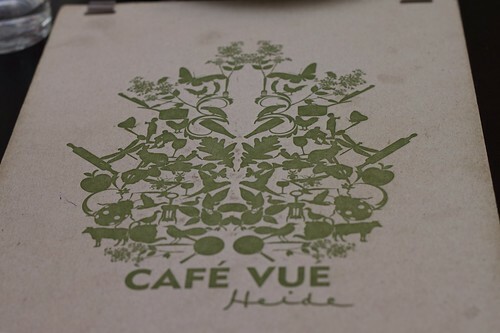 So five of us decided to lunch at the adjacent Cafe Vue before entering the gallery. Mel, who is practically a sister to Tris was on duty and rushed out for a quick hug and greet before we were seated. All of us chose items from the menu du jour, except C who went with the scrumptious lunchbox of the day. For just $15, a serve of cassoulet, beetroot panzanella salad, chicken sausage roll with bois boudran, and pistachio and white chocolate eclair could be yours on the day. Doesn’t it all look appetising and wonderfully presented? It’s like a grown-up box of (culinary) surprises! From the menu du jour you can have your choice of two courses for $35 or three courses for $45. The day that we lunched there were two each for entrées, mains and dessert. There was also a selection of sides if you wished to bulk up your meal. Kathleen and I had the same entrée – the bresaola with parmesan mousse and horseradish grissini. Oh wow. 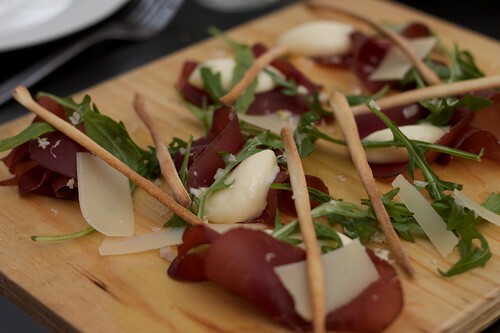 Flavoursome cured meat with mouthfuls of sometimes fiery mousse, cheese, rocket and grissini – simple yet so satisfying. It was presented on a wooden board. I reckon this should be a permanent item. 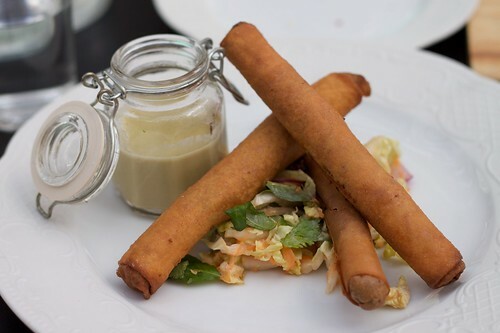 Rob and Tris had the very unusual snail spring rolls with green curry sauce. I thought the spring rolls would be wimpy but they were the size of cigars. Yup, the green curry sauce comes in a cute jar. If you’re a bit wary of trying snails in true French style, then this is definitely a fine introduction – they’re not too ‘snaily’ (killing it in the wordsmith department today, eh?). Menu du jour continues! 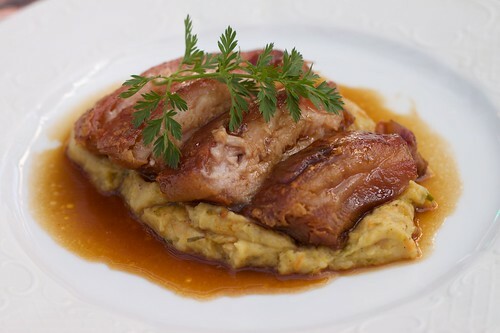 The lads selected the same main – the confit pork cheek, bubble and squeak with calvados jus. I got a taste and it was heavenly though the pork crackling was a little chewy as R noted. Us gals got the shellfish cassoulet with fillet of roasted sea bream. 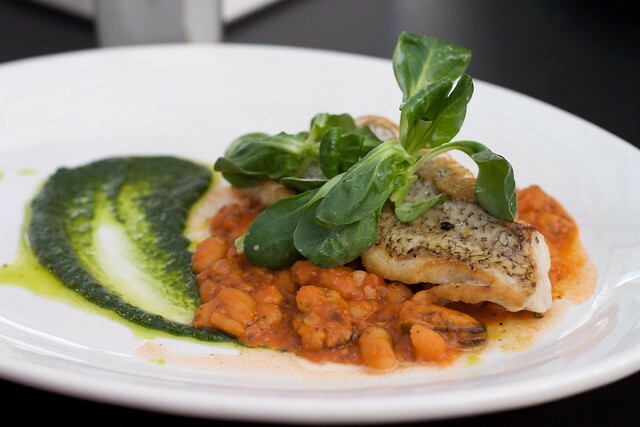 The cassoulet was okay, but the bream and pesto was extraordinary. The cassoulet had nothing whatsoever wrong with it, I think I just prefer mine with duck and sausages and partially blame wonder-woman extraordinaire Tammi’s at her place not so long ago! While C nibbled on her pistachio and white chocolate eclair with the grass green icing, Kathleen splashed out and got dessert, again from the special menu. 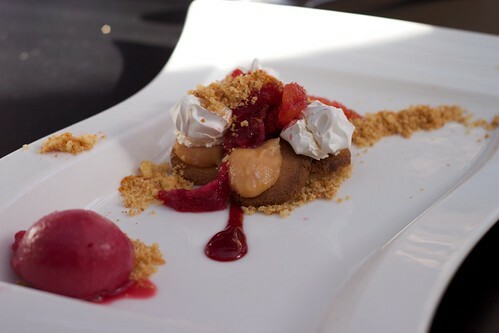 She chose the deconstructed blood orange tart. 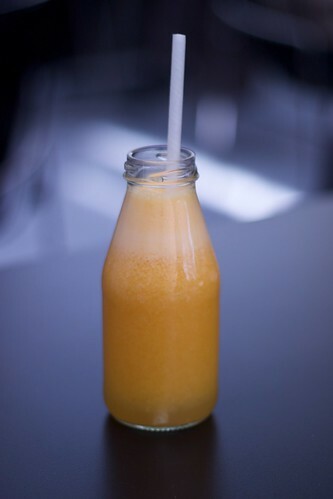 Also, don’t forget the freshly squeezed orange juice! With a paper straw in the cutest bottle. We may have had a bit of a laugh over the coffee cups…yeah, yeah, call us snobs. Their non-coffee crockery is actually really stylish. Excellent company, wonderful food and an afternoon to check out the Carol Jerrems photography exhibition – just the perfect Sunday. I’ll be back more often. This entry was posted in eatie-foodies dining out and tagged breakfast, brunch, Bulleen, Cafe Vue at Heide, cassoulet, French cuisine, Melbourne on August 16, 2010 by gem.